KDE is turning out to be a fabulous Desktop. The latest version - KDE 4.4.0 aka Caikaku is choke full of features which gives the term "Desktop usability" a new meaning all together. What makes KDE all the more appealing is the plethora of well designed applications that come bundled with it. Then again, considering that Windows enjoys a virtual monopoly of the computer desktop market, (with Linux garnering just over 1%), it might take some time for the ordinary lay person to savour the goodies that KDE provides. But hope is at sight. KDE 4.x which is based on Qt4 library is truly portable and works remarkably well across operating systems. "KDE for Windows" is a very active project that aims to port KDE 4 and all the applications that are built on KDE to run natively in Windows. This article accompanied by pictures explain the steps involved in installing a native build of KDE 4 on Windows. Why should I run KDE 4 on Windows ? Fair question. Look at it this way - How would you like to replace your dour Windows Explorer with a cute albeit very powerful file manager such as Dolphin ? How about ditching Adobe Acrobat Reader which is known for its sluggishness for a far more versatile PDF reader like Okular ? 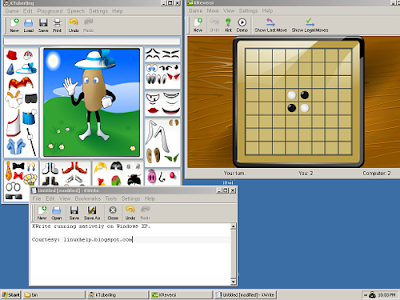 Perhaps you are interested in spending some quality time playing those fabulous games bundled with KDE..., Or how about replacing proprietary Microsoft Office, or even OpenOffice.org, with KOffice ? Which ever way you look at it, KDE 4 brings with it a huge set of useful applications that will raise your productivity to a whole new level. This makes it really enticing to install and use KDE 4.x natively in Windows. The latest version KDE 4.4.0 has already been ported to Windows. Do give it a try.